Neuro Coffee was featured in the May 2017 issue of Robert Irvine Magazine and is touted as the ‘next big thing’ in health and wellness due to its goal of improving health without requiring people to change their daily behaviors. Neuro Coffee(TM) is featured in the May 2017 issue of Robert Irvine Magazine and is touted as the ‘next big thing’ in health and wellness due to its goal of improving health without requiring people to change their daily behaviors. Neuro CoffeeTM is small-batch artisan roasted coffee enhanced with NeuroFactor(TM). This all-natural extract from the coffee cherry fruit is the only supplement clinically shown to increase levels of a protein called brain-derived neurotrophic factor (BDNF). BDNF is essential for your body to grow new neurons and fix old ones in need of repair. “You’ll start drinking Neuro Coffee(TM) for the brain health benefit, but you’ll keep drinking it because the coffee tastes so good,” Robert Irvine Magazine General Manager Matt Tuthill noted in the magazine feature. The feature in Robert Irvine Magazine highlights the 3 key areas that co-founders Chris Dominello and Mike Roussell, Ph.D., built the company on: 1) great tasting coffee, 2) solid science and health benefits, and 3) personal connections with customers. Dominello and Roussell interact directly with Neuro Coffee’s customers—and include free perks for the monthly Neuro CoffeeTM subscribers. 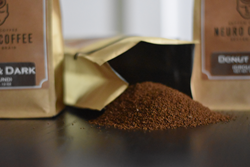 Neuro Coffee(TM) comes in single-serve coffee pods and 12oz bags of ground coffee. The pods and bags are formulated to ensure that each cup of coffee contains the clinically tested amount of Neuro Factor(TM) needed to increase BDNF 143% to support brain health. It is sold exclusively online as part of a monthly subscription or as a single 30-day supply. For more information on Neuro CoffeeTM, visit GetNeuroCoffee.com or http://instagram.com/NeuroCoffee.